Training sessions have restarted in Uzes, France, for LMT riders. 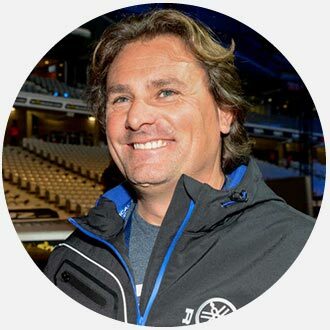 Last week we met Yves De Maria, coach of LMT, who explained us how he is preparing Julien Lieber and Pierre Goupillon for the new MXGP season. How are you preparing for the new season? What are the workouts and what is the typical day of a LMT rider? It depends on the days. If you do the training on track or if you don’t do it. When you train on track the day starts early in the morning with a 45/50 minute run, on an empty stomach, afterwards you have breakfast and then you go to the track to train on the bike. On the track there is definitely a warm up, then depending on the day you do either endurance or interval training. Today, for example, we did endurance, which means two rounds of 40 minutes on the bike. Yesterday, we did another type of training: more fast laps, stops and restarts. Training is not the same everyday. On the days when there is no activity on track, in the morning you work out, in the afternoon you ride the bicycle, one other day you swim and go to the gym, in short, you alternate everything. We train 6 days a week. 4 days are dedicated to the training on the bike, 2 days to the sport activity, 1 day to the rest. Rest is equally important. We started in November with two weeks of only sport activity, exactly on November 15. Before resuming, we made some technical tests on the motorbikes and some physical tests on the riders, conducted at the Sports Medicine Center. The resumption of the training was therefore gradual and progressive. How does the training change when it starts the race season? Well, with the start of the season you train differently. The training on track is done only once or twice a week , while the rest of the times it is physical and aimed at recovery. We talked about the physical and on the bike preparation, but when does the psychological, motivational work on the riders come into play? And the nutritional one? The psychological and motivational work on the riders comes into play immediately, already during the physical preparation, and it is very important, as well as all the other work done with athletes behind the scenes. Even the nutritional aspect is relevant, we have a doctor who is responsible for preparing a balanced diet plan that guarantees a proper intake of vitamins, carbohydrates, proteins and fats. The diet changes as we approach the competition period to better support the physical performance of our riders. So the athletes are followed 100% and in 365 degrees? That’s right. They are taken care of throughout. Have there been any changes this year compared to last year’s general training program? Yes. We have increased the training days on the track and reduced the number of sporting days. Last year they were only 3, now they are 4. Therefore, this year, the training is harder, but also more focused. We will see the results along the way, but I am pretty sure that this change will be positive for our riders.